Best Time Ever With Neil Patrick Harris ended Tuesday night's episode as totally blue. Of course, it was a rollicking good time with guests like Shaquille O'Neal and Gloria Estefan. At the end of the episode, Blue Man Group performed on Best Time Ever and totally stole the "End Of Show" show. Shaq promised the audience that it would be one of the messiest finales in the show's run and he wasn't kidding — this week's conclusion had lots of blue (paint), lots of pipes, and a lot of fun! The gang of blue guys began their performance while tamely druming on pipes, until NPH brought out a mega pipe and the music began to pick up the pace. Suddenly, one Blue man collapses and the remaining two, along with Harris try to resurrect him. But then one gets an idea: He gives NPH some of his blueness and they continue drumming and maneuvering the ever growing pipe. Finally, Shaq gets in on the action and pops a big ol' blue balloon on Harris, which dumps even more blue paint onto the host. I guess that makes him an honorary Blue man — and I'm jealous. These guys are seriously the coolest. Just look at them work and be amazed. Throughout the episode, the Blue men found their way into plenty of mischief in the show's control room, playing on the set's aracade game, and hanging out with singer/dancer Nicole Scherzinger. 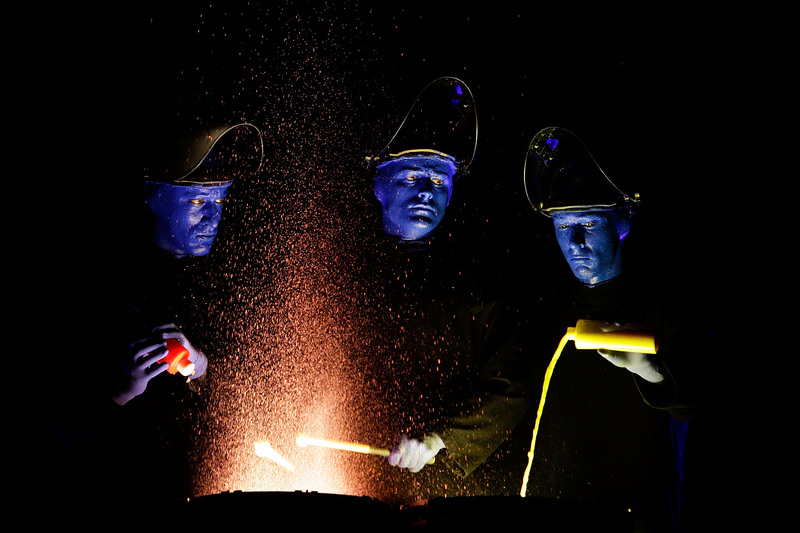 Since 1991, the Blue Man Group is one of the most recognizable and well-known acts, performing their music and colorful act all over the world. They even have a new show opening on Nov. 20th at the Luxor in Las Vegas. The group even inspired one of the best jokes from the comedy series Arrested Development. And for that, I will always love the Blue Men.